Award-winning creative and digital recruitment agency, Concept Personnel, has a new hand at the helm of its Newcastle Office. Following its most successful year ever, Erin Kirtley has been promoted to Regional Manager, and will continue to drive the business forward in the North East and Scotland. Erin, 28, from Ashington, has been a key part of Concept’s team for the past three years, managing several key accounts. 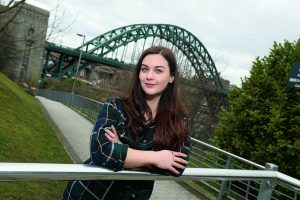 After graduating from Northumbria University with a degree in Interactive Media Design her first job was in-house as a Graphic Designer and Digital Marketing Executive before being placed by Concept Personnel at Cargo Creative as an Account Manager. Firmly established as the leading digital and creative recruitment agency in the region, 2017 saw Concept celebrate its 15th anniversary and win a raft of new contracts with blue chip companies. Erin will head up the team in Newcastle, but will also manage the Scotland office which serves the thriving creative and digital industries in Glasgow and Edinburgh.“I’m really looking forward to getting started in my new role,” said Erin. “We have a fantastic team in Newcastle who have all spent time working within creative, digital or marketing based roles. It is that extra bit of industry knowledge combined with our caring and personal approach to customer service that our clients really value. Contact Erin Kirtley on 0191 233 9560.